The Guest Depot serves as the welcome center and reception station for all patients and visitors at the American Family Children's Hospital. At the Guest Depot, families and visitors can get directions, help with hotel accommodations and other "concierge" services they need. Modeled after an old-fashioned train station, the Guest Depot is staffed from 7am-5pm Monday-Friday (closed on weekends). For information when the Guest Depot is closed, please visit Security. A gift from Friends of UW Health, the Guest Depot also will provide health screenings for visitors to keep our patients healthy. 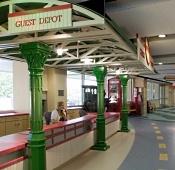 The Guest Depot is just one element of the whimsical design of the American Family Children's Hospital, which has a main floor designed to look like a small town in Wisconsin. From the moment they step off the elevators, visitors encounter an almost Disney-like environment. Tractor tire tracks lead you to the security office, with its crimped metal walls designed to look like a grain silo. Just as the farmland gives way to the city while driving Wisconsin's countryside, the train station "Guest Depot" greets visitors as they turn the corner, along with a pharmacy and gift shop that has the look and feel of an old-time community drug store. Colorful barber poles twirl outside the façade of a barber shop near a cobblestone alley, and a flashing movie theater marquee welcomes you to the Pierce Family Theater, where patients and families can take in a film. Just outside the theater, a faux sugar maple tree's full fall foliage towers above park benches and a fireplace in the main lobby's sunny atrium, as visitors round the bend to the Lake Michigan beach area – complete with a replica of the Fond du Lac lighthouse and footprints etched in the watery blue and sand-colored flooring.